HANOI, Vietnam—Ba Sao Investment, Co., Ltd. recently installed a complete audio system by HARMAN Professional Solutions at the Central Circus Theatre. 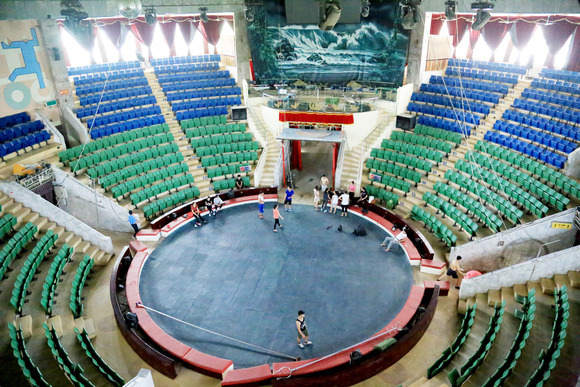 Located in the Hai Ba Trung district and founded in 1956, the Central Circus Theatre is the oldest circus in Vietnam. The theater hosts five to seven performances per week by its own Vietnam Circus Federation, as well as occasional visits from international troupes. In order to enhance the facility’s sound quality and provide a more immersive performances experience for audiences, the Central Circus Theatre hired Ba Sao Investment to update the facility’s aging audio system with a cutting-edge integrated audio solution. Ba Sao Investment selected a complete HARMAN audio solution made up of JBL speakers, Crown amps, dbx signal processors and Soundcraft digital mixing consoles for their intuitive operation, unmatched flexibility and world-renowned sound quality. The HARMAN system in the Central Circus Theatre consists of 12 JBL STX825 two-way speakers, 6 JBL STX828 dual 18-inch subwoofers, 18 JBL PRX715 two-way portable powered speakers, Crown MA5000 power amplifiers, Soundcraft Si Performer 2 digital mixing consoles and dbx DriveRack 260 speaker management systems. Boasting a wide frequency range and broad 90-degree by 50-degree coverage, the JBL STX825 is a dual 15-inch two-way speaker and provides maximum impact, portability and ease of use. The JBL STX828S dual 18-inch subwoofer delivers maximum low-frequency performance and 2,000 watts of continuous pink noise power handling. The system is powered by Crown MA5000i amps, and augmented by portable JBL PRX715 two-way powered speakers.